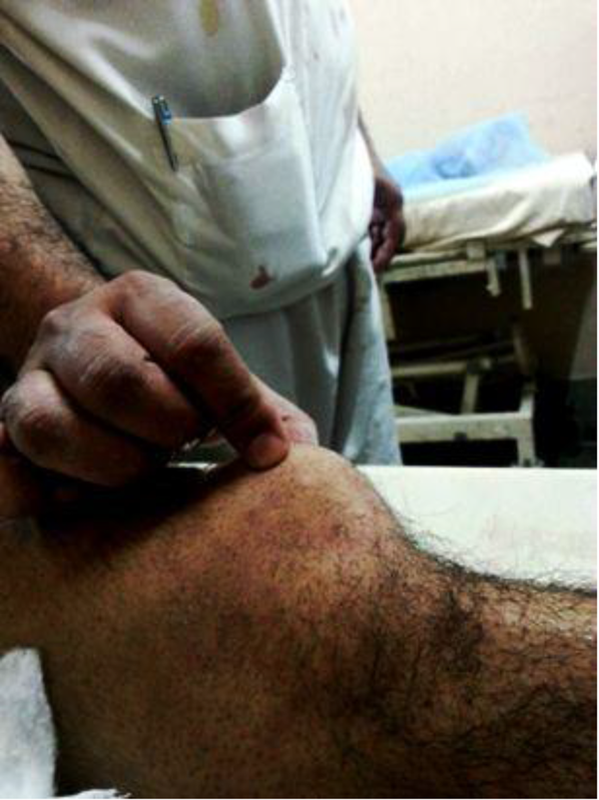 To Cite: Ahmad Khan H, Bashir Shah A, Kamal Y. Vertical Patellar Dislocation: Reduction by the Push Up and Rotate Method, A Case Report and Literature Review, Trauma Mon. 2016 ; 21(5):e24705. doi: 10.5812/traumamon.24705. Introduction: Patellar dislocation is an emergency. Vertical patellar dislocation is rare, often seen in adolescents and mostly due to sports injuries or high-velocity trauma. Few cases have been reported in the literature. Closed or open reduction under general anesthesia is often needed. We report a case of vertical locked patellar dislocation in a 26-year-old male, which was reduced by a simple closed method under spinal anaesthesia. A literature review regarding the various methods of treatment is also discussed. Case Presentation: A 26-year-old male experienced a trivial accident while descending stairs, sustaining patellar dislocation. The closed method of reduction was attempted, using a simple technique. Reduction was confirmed and postoperative rehabilitation was started. Follow-up was uneventful. Conclusions: Vertical patellar dislocations are encountered rarely in the emergency department. Adolescents are not the only victims, and high-velocity trauma is not the essential cause. Unnecessary manipulation should be avoided. The closed reduction method is simple, but the surgeon should be prepared for open reduction. Patellar dislocation is an emergency with an annual incidence of 5.8 per 100,000 individuals. It is most common in adolescents aged 10 - 17 years, in whom there is an average incidence of 29 per 100,000 (1, 2). Acute patellar dislocations occur most commonly laterally, with approximately 10% occurring following a direct blow (3). Other less-common types of patellar dislocations have been described in the literature, including medial and superior, and with rotation about the vertical and horizontal axes (4). We report a case of an intercondylar locked vertical patellar dislocation with nearly 90° rotation about the vertical axis, which was reduced using the closed method. The age of the patient, the trivial accident, and the successful closed reduction under spinal anesthesia makes this a rare case. A 26-year-old male was descending stairs when he skipped two steps and jumped to the third. He lost his balance and fell forward, with a twist of his left knee. The patient was brought to the hospital within 30 minutes of the trauma, with severe knee pain and loss of range of motion. He denied any systemic illness or prior trauma to the knee. Upon physical examination, his left knee was in full extension, with tenderness over the lateral and medial aspects of the knee. The patella was palpable and visibly rotated vertically in the intercondylar region of the femur, with tenting of the skin. The articular surface was palpable facing laterally (Figure 1). There was mild swelling and ecchymosis, and his distal neurovascular status was normal. 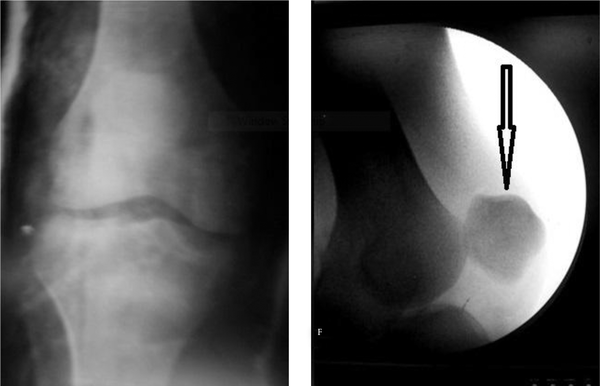 The radiograph showed vertical dislocation of the patella in the intercondylar groove, with the medial border facing into the groove (Figure 2). Closed reduction without anesthesia was attempted by manipulating the patella and attempting to rotate and translate it superomedially at the same time, with the knee in full extension and the hip in flexion to relax the quadriceps. Since this maneuver is painful and the patient was apprehensive, he was transferred to the emergency surgical theater, where spinal anesthesia was given and another attempt was made at closed reduction using the push up and rotate method, which was successful. Post-reduction knee range of motion was full passively, and patellofemoral tracking was normal. 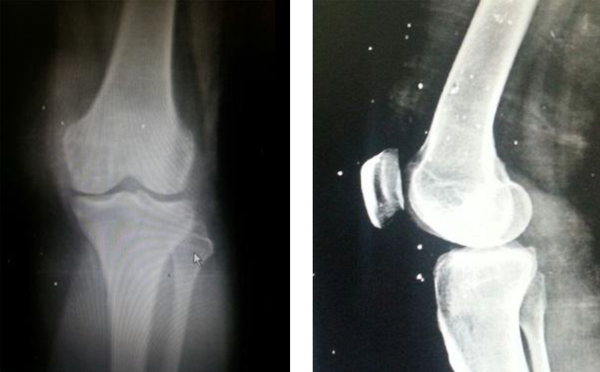 Postoperative radiographs showed normal position of the patella without any osteochondral fracture fragments (Figure 3). The knee was immobilized in a posterior plaster slab for three weeks, and static quadriceps exercises were started immediately. After three weeks, gradual range of motion was initiated in a hinged knee brace. 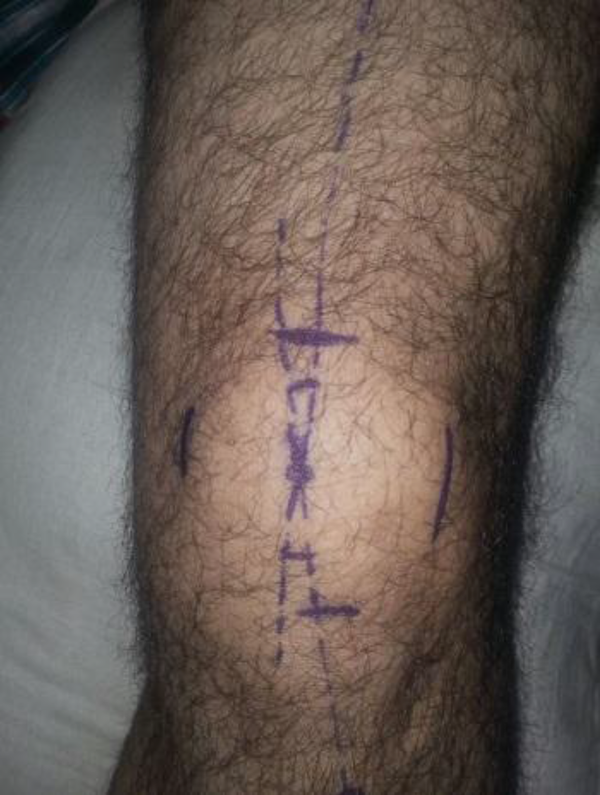 After six weeks of reduction, the patient achieved pain-free full range of motion of the knee, with minimum discomfort. The patient was a hard laborer and returned to his activities. There were no signs of ligament laxity. At one year of follow-up, the patent was comfortable, with no patellar tenderness, no apprehension, and normal patellar tracking (Figure 4). Cooper (5) first described a vertical patellar dislocation 1844, and 124 years later in 1978, Colville (6) performed a literature review, stating that 28 cases had been reported in the international literature. However, during the last two decades, many cases of vertical patellar dislocation have been cited (4, 7-12). The emphasis has been on classification, mode of injury, and method of reduction (Table 1). However, no case series is available that draws a specific conclusion regarding the method of reduction or type of anesthesia used. In this report, we describe a patellar dislocation with rotation around the vertical axis, with the patella wedging in the intercondylar groove. Most patellar dislocations are extra-articular dislocations, which are outside the normal patellofemoral articulation, displaced laterally. Intra-articular dislocation of the patella, which has a loss of patellar congruity and displaces into the intercondylar groove or tibiofemoral articulation, is a rare injury. Two types of intra-articular dislocations have been described: horizontal and vertical. In the horizontal type, the more common pattern, the patella rotates about its horizontal axis, leaving the patellar surface facing superiorly or inferiorly. In the vertical type, the patella rotates about its longitudinal axis, with the articular surface facing medially or laterally (13). Since the dislocation in the present case occurred while the patient was descending stairs, the mechanism was similar to that described by Levin (14). The partially flexed knee and externally rotating tibia is suddenly internally rotated and hyperextended so rapidly that the patella cannot glide back into its normal position. The patella rotates around its vertical axis and becomes locked with its medial border perched over the intercondylar groove. The tight quadriceps acts like a bowstring and prevents the patella’s relocation. As the forces are perpendicular to the longitudinally oriented forces of the patella, there is not necessarily any injury to the quadriceps or patellar tendon, in contrast to horizontal dislocations, but some disruption of the patellar retinaculum does occur. The lateral femoral condyle projects more anteriorly than the medial condyle, and in the proximal portion, the patellar articular surface flattens on the medial femoral condyle, while that the lateral surface projects somewhat anteriorly, creating a slope towards the medial condyle. In our patient, closed reduction was attempted in accordance with this anatomic fact. A push was given to the inferolateral pole in the superomedial direction towards the flattened portion of the medial condyle of the femur, using the thumb of the left hand, along with a clockwise rotatory force applied to the medial projecting surface of the dislocated patella with the palm of the same hand. Repeated attempts at closed reduction should be avoided, as this can lead to osteochondral fractures (15). The surgeon should be prepared for open reduction. Wajid et al. used AO clamps for percutaneous reductions (10), while Chang et al. used both hands for reductions under general anesthesia (13). Both techniques seem to yield good results. Vertical dislocations of the patella are encountered rarely in the emergency department. Adolescents are not the only victims, nor is high-velocity trauma the essential cause. Unnecessary manipulation should be avoided. The closed reduction method is simple, but the surgeon should be prepared for open reduction. We acknowledge Dr. Naseem Ul Gani and Professor Munir Farooq for their help during the initial write-up of this manuscript and for supervision during the follow-up period. Authors’ Contribution: Study concept and design: Hayat. Analysis and interpretation of data: Hayat, Adil, and Younis . Drafting of the manuscript: Hayat. Critical revision of the manuscript for important intellectual content: Hayat, Adil, and Younis. Supervision: Hayat.